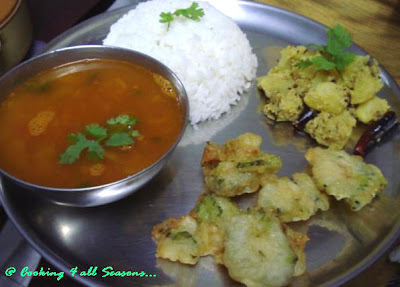 Cooking 4 all Seasons: Musuri'r Dal and Alu Posto with Bitter Gourd Bajji ~ Bengali Cuisine! Ok, once we had our delicious dinner with Luchis and Alur Dom, I was prepared for another dose of Bengali feast. From all the recipes that I finally collected and decided that I could do, I selected those that were comfortably within out domain. Yeah we got to experiment, but then when its the dinner for the entire family involved, we can't take chances of it not being liked. And I must say, the bongs have so much liking to Posto, that its surprising!We, of course use the poppy seeds mostly for our non-veg items, so imagine that gets itself into veggie! Well since I don't' eat meat, poppy seeds are not very close to my taste buds, that is, being quite sometime. So digging into something with loads of that was an attack on the senses. Having decided that its going to have all those poran, went shopping to get all the ingredients required. This is the first time, I am cooking with kalo Jeera, I understood bengalis use this for seasoning as we use mustard. Because, all the dals asked for tempering with Kalo Jeera. Well no probs, I have just the thing on hand. Athamma on seeing the seeds, was very curious knowing how it might be used. She asked if it was sesame seeds. I told her that its something that Bengalis use it a lot and I have no idea of the taste! I was all set for the dinner. Hubby dear took everybody to the terrance so that I could complete the dinner without any disturbance. I had quite a few on hand. But before actually getting to do, I planned on how to do things at the same time. it was quite interesting to note how different each cuisine is and the way its cooked. I had some massoor dal at hand and have been planning to cook this for a long time, So when I saw a recipe with this dal, I was so happy. And naturally with Aloo Posto being so common and enjoyed, I can't miss out that right! And I read no bengali feast is complete without Uchche or Bitter Gourd. And that too as a bajji. Now who wouldn't want to eat this deep fried. Anyways, both hubby and Athamma are very fond of bitter gourd. Since this was part of the RCI:Bengali, I had already mentioned in my earlier post that I am going to cook everything from Sandy's blog. 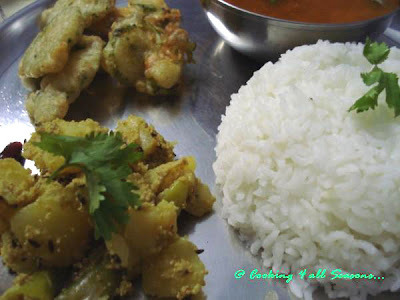 So these two recipes Masur Dal and Alu posto are completely cooked from her blog. though I have credited her with these wonderful dishes that we enjoyed, I never had a clue that after 2 years the correlation between my two posts will get lost. Check out her version of making authentic way. On hindsight it may look like I failed to give her credit when I have actually done it. And I have no problem rectifying the mistake when it is done genuinely. 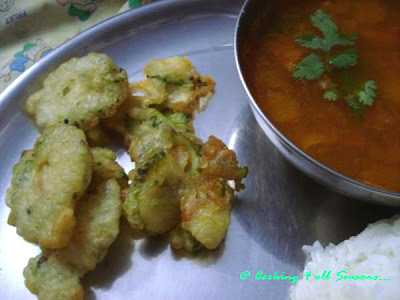 The bitter gourd bajji recipe was from a paper cutting. Heat oil, temper with Kalo jeera/Kalonji. The add the finely chopped onions and fry till they turn pink in color. Add the chopped tomatoes and cook till they become a fine pulp, To make it soft, add salt. Bring it to boil and cook till thickens. Since you are going to mix with rice, it can be on the thin side. This was a change from our usual Aloo fry, it had a nice coating with poppy seeds. Grind the posto/poppy seeds to a fine powder. I had a tough time with grinding this as my jar is not small enough. So I soaked for a while, then using the chopping board, ground this using a stone. Best would be to grind the entire batch and dry and store. Cut the potato in cubes and soak in water, else they develop black spots. Slit the green chillies. Heat oil in a Kadai/Pan, add the Cumin seeds, once they sputter, add dry red chillies. Drain and add the potato cubes in the oil with a pinch of haldi/turmeric powder. Saute well so that it gets covered well. I normally add the salt at this stage as they get soft. Add little water and the chopped green chillies. You can sprinkle very little sugar if you want. But I didn't. Cover and cook till the potatoes are done. I almost let it get dry as suggested. Take care that the potatoes don't get mashed up though. Wash and cut the bitter gourds into 1 " circles. Boil water and add the bitter gourds. Let it cook for 3-4 mins. Drain and add turmeric and salt. In a bowl, add the maida, salt, soda and the other ingredients. Mix well and let it rest for 5 mins. Fry on both sides and once done drain to kitchen towel. Since I did all the dishes together, it helped being little organised. I soaked the rice for 15 mins. Then cooked it. By which time, had the water for bitter gourd boiling and cooked the bitter gourds. This removes the bitterness to greater extent. Pressure cooked dal along with this. Once all this were on way, got the things for aloo ready. While the aloo was getting cooked, got the dal tempered with onions and tomatoes. Finally had the batter ready for bitter gourd and just before serving, deep fried them and served. Our Bengali thali was ready in 45 mins! wow, everything was yummy. 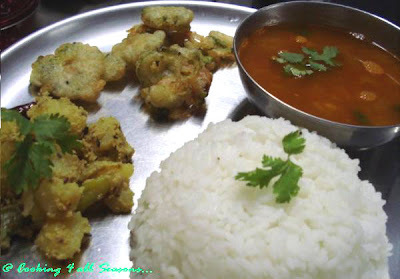 Of course, my hubby wouldn't eat a bland dal or bajji, so I had added chilli powder to it. I am not sure if this cha nge is accepted but still it added a good taste to the overall dishes. 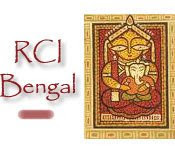 I am sending my Bengali thali to Sandeepa, for her RCI Bengali. And wanted to share my Bitter gourd bajji with Pooja from My Creative Ideas for her VOW: Bitter gourd. Thanks for hosting such wonderful events ladies!